New Year’s resolutions are thought to date back some 4,000 years, to Babylonia. True, the Babylonians weren’t vowing to develop rock-hard abs or drop 25 pounds by bikini season (their main goals were to repay debts and give back the stuff they had borrowed), but the sentiment was the same: to start the year clean and get off to a fresh start. It’s an admirable, even noble goal, these resolutions. Yet for about 80 percent of us, our resolutions will fizzle by the third week of January. There are lots of reasons we fail to meet our goals, and one biggie is this: we simply fail to approach them one day at a time. Each day is important, important enough that we need to treat each one with focus. Starting with Day One. Fortunately, if you live in North Carolina a lack of options isn’t a viable excuse for failing to get the new year off to an active start. Not with the First Day Hikes program. First Day is an effort to help us get moving with guided hikes held in state parks nationwide. The notion of a New Year’s Day hike in North Carolina dates back 40 years at Eno River State Park in Durham; State wide, everyone embraced First Day with vigor just a few years ago. 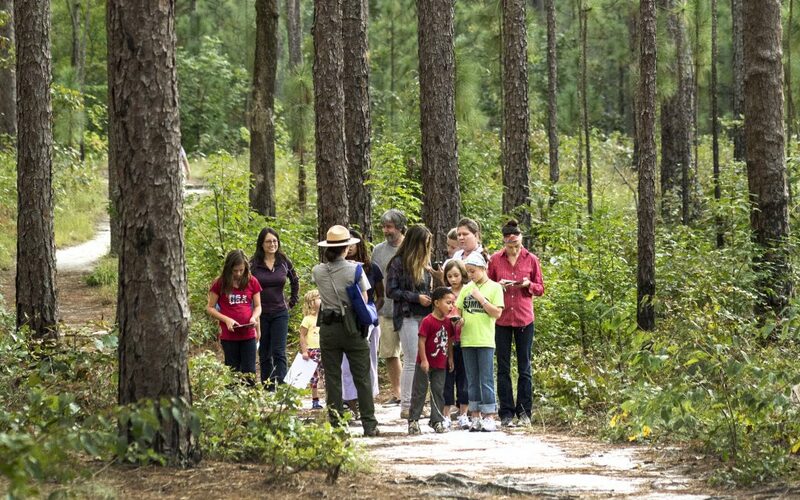 This year, on January 1, more than 40 First Day events are scheduled at N.C. State Parks, from a series of scavenger hunts at Falls Lake State Recreation Area to a 7-mile march at Chimney Rock State Park that will gain a robust 1,200 feet of elevation. Snow won’t deter the First Day Hike at Grandfather Mountain State Park; the rangers will simply issue snowshoes to the hearty hikers who show. Crowders Mountain State Park will cover two states with its hike, while at Fort Fisher State Recreation Area, they’ll hike to a concrete bunker that housed munitions in WW II, a hermit throughout most of the 1960s. Hikes, in short, with enough diversions to get your mind off the physical challenge of getting your year off to a healthy start. Diversions that will make you realize that maybe an active lifestyle isn’t so daunting after all. Blowing Rock area: Mountains-to-Sea Trail, Holloway Mountain Loop, 2.4 miles, noon. Charlotte: Seven Oaks Preserve, part of the Carolina Thread Trail, 5.6 miles, 1 p.m.
Greensboro: Laurel Bluff Trail (Lake Townsend), 4 miles, noon. Durham: Horton Grove Nature Preserve, Triangle Land Conservancy, 3 miles, 10 a.m.
Raleigh: Mountains-to-Sea Trail at Falls Lake, Friends of the Mountains-to-Sea Trail, 2.5 miles, 2 p.m.
Wilmington area: Stone Creek Gamelands, Friends of the Mountains-to-Sea Trail, 3-4 miles, noon. That’s nearly 50 hikes, many of which are doable by folks coming right off the couch. Be in nature, be with others, be active. It’s hard to imagine a better kickoff to 2017.